Tallmadge City Schools provides WiFi access to teachers and students. This access is filtered and recorded. None of this data is tracked or recorded when you are not on the Tallmadge City Schools network. Using this access requires a certificate to be installed on the device as well as sign in to your tallmadgeschools.org (for teachers) or stu.tallmadgeschools.org (for students) Google account. 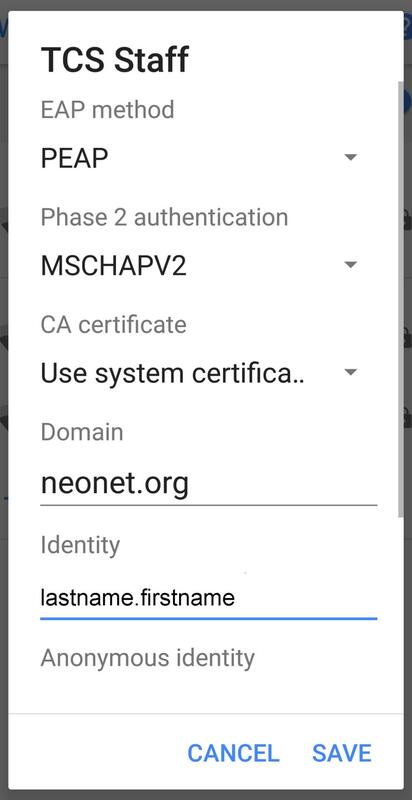 After connecting to Student or Staff wireless network, follow the directions that pertain to your device to install the certificate. After installing, you may need to restart your phone/device. When you connect to the TCS Staff or Student network on an Android you will see a screen similar to this. The settings should be as follows. Click here and carefully follow the instructions on this page. Download the installer for Chrome here and for Firefox here. Follow the instructions on this page.